Three tenors share the famous Verdi aria La donna e mobile, at startlin (miked) volume, at the top of this musical entertainment. No wonder they exit stage left with an amusing swagger and a cocky wink. True, maybe that’s the subtext of all tenor-hood — witness centuries of opera ego jokes about the possessors of impossibly high voices, male or female. But the moves are a tiny, silent annotation, too. Marion J. Caffey’s inspiration, in his original Mo’ show of 2000, is to defy, rather spectacularly, the odds-against racial slant built into opera, with a trio of talent-heavy, classically trained black tenors. 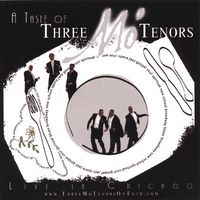 More than that, after an assortment of operatic solos — including Handel, notoriously difficult, and an aria from Manon famous for its extended notes — the three mo’ tenors will, separately and together, apply their pipes to a hodge-podge of 10 musical styles, some more unexpected than others, from Broadway to blues, Motown to white-guy rock (OK, OK, no English music-hall ditties). “High brow, low brow, they all agree/ we’re the best in harmony,” they borrow from Five Guys Named Moe. You get to spend an evening with three personalities, excellent singers who demonstrably love occupying a stage and engaging an audience. Not to mention a first-rate, five-member band, led by Fabiola Leon from the piano. If the idea is to showcase versatility, the extreme outer reaches traditionally being opera, Three Mo’ Tenors actually works in reverse. It’s like Three Mo’ Divas (seen here a couple of seasons ago) that way. Kenneth Alston Jr., Ramone Diggs and Phumzile Sojola do a creditable job of their opera assignments. And why wouldn’t they? They have opera training and credits. What’s more remarkable, arguably, is that they don’t let these credentials stop them from delivering blues, Broadway, soul, gospel and killer spirituals with such thrilling command and style. Think of those embarrassing encores (sometimes, shudder, whole albums) where big opera stars like Pavarotti condescend to start their full over-heated operatic engines on spirituals or The Impossible Dream, and reduce them to roadkill. Three Mo’ Tenors isn’t like that at all. It’s tuned to style, and presented with charm. The most unexpected offering, for a trio of African-American tenors, is the Queen medley. We Are the Champions is pure processed (white) cheese by now, here presented with a sly hint of knowingness. But there’s also a homage to Ray Charles, along with the odd Gladys Knight chestnut (Midnight Train To Georgia). And Sojola mines his South African background for an appealing, crowd-embracing medley. For some members of the audience — me, for example — the mere intro sequence of Bring Him Home, the big teary Jean Valjean showstopper from Les Miz, is enough to induce a spasm of fear and stress. Sojola, the most puckish of the three, and Diggs, the most naturally wistful, manage to erase bad memories of several generations of quivery over-extended “actor-ly” performances. Nothing, probably, can redeem the dreck-y This is the Moment from Jekyll & Hyde, but Alston has a go.